Support, equipment and over £6,000 towards repairs has been raised by the boating community to help the now homeless boater who lived on the 70′ converted Joey boat. The hire company has not offered any assistance. 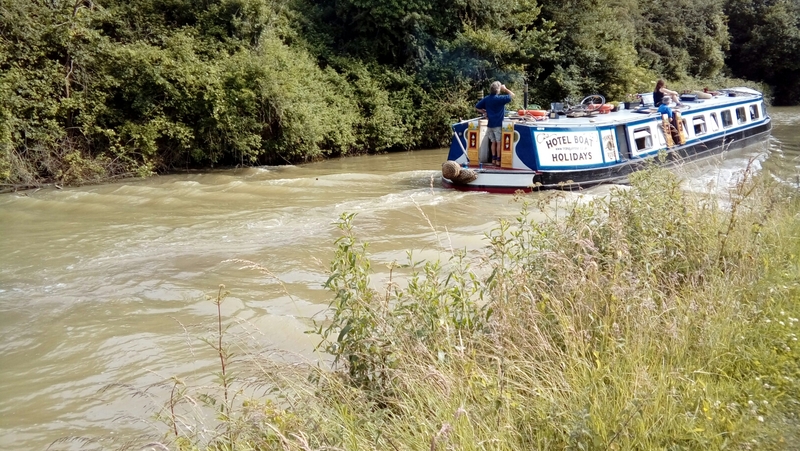 The stag party hired two boats from ABC at Hilperton at the weekend, and were the subject of numerous complaints as they drunkenly drove the boats at speed towards Bath, hitting and damaging many boats and shouting abuse at liveaboards and passers-by. They were later barred from the Cross Guns pub and on Saturday ABC Leisure terminated their holiday, leaving them on the towpath with their suitcases in the heavy rain. Please come to the meeting. As a community we need to take decisive action to stop the wilful damage and abuse by stag party boats once and for all as it is clear that previous measures have not worked. This entry was posted on Monday, September 24th, 2018 at 11:21 pm	and is filed under Community. You can follow any responses to this entry through the RSS 2.0 feed. You can skip to the end and leave a response. Pinging is currently not allowed. Great about time we made our voice heard. Can you please keep us updated with and results from the meeting.